I often compare the role of the “Innovator” to that of a “Super Hero”… as our jobs, quite literally, are to create a better future by making the world a better place to live. Whether we are searching for the elusive cure to a devastating illness, are making technological advances to improve how the world learns, communicates, and interacts, or are formulating better consumer products and services to improve day-to-day life, we are all on a mission to leave the world better than when we started. 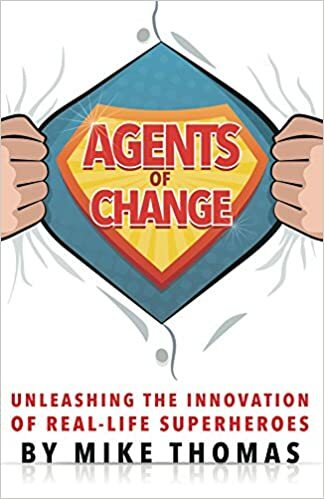 And while I write this blog from the perspective of business innovation, this analogy spans, probably even more strongly, to the innovators outside of the “cubicles” who heroically serve as parents, coaches, and teachers… improving the lives of our children, families, and friends each and every day. This “Super Hero” analogy works for me because I am fortunate to have surrounded myself with amazing people, who accomplish astonishing feats of problem solving, invention, and execution each and every day. As I write this, I want to imagine a certain confidence and swagger as these proud, accomplished individuals saunter through the hallways, reveling in the dragons slain, the “Mission Impossibles” made possible, and the tall buildings leapt with a single bound. I want to feel a culture of endless possibilities, of imminent success, and of fearlessness. I want to see and feel all of this in my mind… but unfortunately the reality is that it is often the exact opposite that holds true. These very heroes, who accomplish so much and have so much to be proud of, often go home each night feeling more like failures than successes. Instead of focusing on all of the good that they achieve and the obstacles that they overcome, they instead dwell on the boxes that they haven’t yet checked and the “To Do List” that seems to grow even faster than a speeding bullet. I personally experienced this over the past week, as I managed to make some dramatic progress on some key business challenges across more topics than my short-attention spanned temperament would typically allow… and yet as I shut down my computer late on Friday I was overwhelmed with the weight of what was yet to be done both at work and at home. After a week in which I should have felt “super”, I instead felt defeated as I dwelled on the problems that I was NOT able to solve rather than the ones that I conquered. So how do we as individuals, as leaders, and as mentors help to focus more on our epic successes rather than on our unfinished business? 1) Don’t Save Every Kitten from a Tree. The reality is that at any given moment, there are more tasks to be completed, emails to be answered, and meetings to be attended than can possibly be achieved… no matter how super your powers are. If you measure yourself by “doing everything” then you have doomed yourself to failure before you even start. Eliminate or delegate tasks that are low priority, delete emails (don’t just ignore them, DELETE THEM) that you know you will never get to, and skip meetings in which you will not add unique value. There will always be kittens in trees, and it is impossible to save them all. 2) Don’t Fail to Save the World Because You Are Saving a Kitten. Make sure that you predominantly focus your effort on the “World Changing” and “Hero Worthy” missions that you uniquely are designed to deliver. Find the places where your “powers” are most suited to make a key business and organizational impact and disproportionately invest your time there. Block it off on the calendar and be deliberate about where you do and do not spend your time. If you delay “saving the world” until all of your mundane chores are done, then the fate of the world is doomed. 3) Leverage Your Powers and Know Your Weaknesses. Just because you are a super hero does not mean that you have to solve every “super” challenge. If you are “Batman”, and a mission requires flying and X-ray vision then leave it to “Superman” rather than abusing yourself in trying to solve something that others are better suited to do. There are more than enough problems to go around, and focus your energy against the obstacles in which your unique powers are best utilized. That is not to say to only do “easy” rather than “hard” missions, but rather to avoid your personal “kryptonite” and to focus on areas in which your “utility belt” is best armed to solve. 4) Make Sure You Trust the Source of the “Batsignal”. A Super Hero often will be called in to “save the day” when a key crisis emerges. And when the “bat signal” is projected into the sky, this hero will drop whatever they are doing and bolt into action. This bias to action is part of what makes the hero “super”, however… it is critical to know and to trust the person projecting the signal into the sky. There are a lot of real crises but also a lot of manufactured ones… there a lot of leaders who will only yell “Fire” when the house is burning down and others who yell because they like the excitement of “fire drills”. Before answering the call and running to save the day, make sure you know that it is a crisis worthy of your time and your talents. 5) Don’t Neglect Your “Secret Identity”. Even the best of super heroes cannot be solving all of the world’s problems every minute of every day. Taking time to rest, refresh, and recharge is not a “waste of time” or a “dip in productivity”. It is critical to step out of the crisis and to invest in your health, your well-being, and your relationships. Read a book. Watch a movie. Go for a run. Take a nap. Take some time to put your cape in your briefcase, and to enjoy an evening as “Clark Kent”. Otherwise, you will burn yourself out and your powers will have run out when you need them the most. As Innovators and as Leaders, as parents and as teachers, we are surrounded by an endless barrage of crises, challenges, and obstacles in a world that gets faster and more complicated every day. No matter how talented, how dedicated, or how hard-working we are, we cannot do everything. The world will not end if the email inbox is not emptied or if you miss a meeting. Your kids can live happy lives if the dishes don’t get done or the laundry does not get put away. 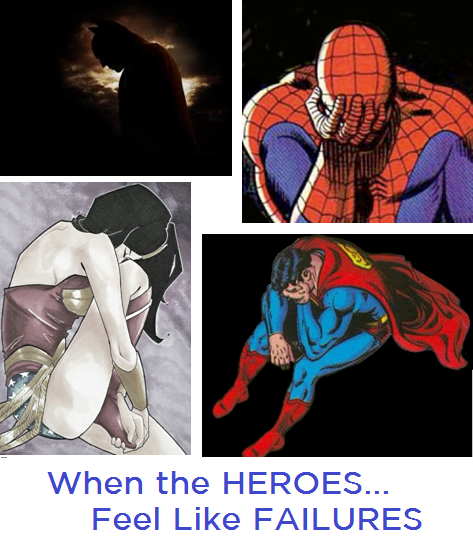 Failing to check every single box does not make you any less of a Super Hero, so do not let these small “failures” defeat your sense of accomplishment from the central missions that you complete. Focus your time, your energy, and your powers where they are needed most and take pride in your successes… and trust that the kittens will find their way out of the trees without you.